Wading through heaps of good and bad marital advice on the internet to find the one particular article that you need is challenging. 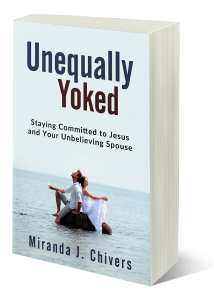 Finding resources pertaining specifically to the unequally yoked marriage is even more time consuming. To aid you in your search, I’m providing some links below to a few helpful websites. These resources are not exclusive to faith divergent marriages, but they do contain some excellent information in this area. Although our need for good resources is specific to faith differences in marriage, our search is compounded with other dilemmas too. First of all, our faith indifferent or antagonistic spouse may be cold to reading these very resources that interest us. Perhaps, the very possibility of studying anything to do with the subject of faith, or even marriage, might be a turn off. Secondly, he/she might be adverse to learning about this perceived conflict, simply because they see it as the believing partner’s issue. Thirdly, some partners perceive reading marriage books or blogs as acknowledging there’s a problem with our relationship—and this possibility triggers the fear button. This scary thought implies “admitting something is wrong means acknowledging that I need to change.” And most of us are adverse to changing ourselves. Change requires us to examine ourselves and admit we need help. Getting help means reaching out. The immediate search tool is often the internet. But it takes time to find good resources. Even when we find a great one, we can’t force-feed our partner every book or blog that we come across. But we can feed ourselves. Reading the Bible should be our #1 resource. As we build ourselves up spiritually, we learn to recognize the enemy’s attacks and strategically intercept before things get out of hand. Check out 2 Corinthians 10:4-6 in the various translations. I love this verse in The Passion Translation. We are not alone. Help is a always a verse away. Here’s are some great free resources that I mentioned. You may need to wade through each site to find the blogs that fit for you, but they will give you meat to keep you going in this journey.